We liberated the RNA I gene from the origin site and put under a constant expression of different anderson promoters. By this we proved that plasmid copy number control can be controlled as desired. This is even more likely to occur when the plasmid copy number is low. When the cell divides, lower copy plasmids tend to be lost in next generations. For the proof of concept of our system, we demonstrated that plasmid copy number can be controlled as desired by employing any kind of promoter upstream of an RNA I gene. We liberated the RNA I gene from the ColE1 origin of replication, by mutating the origin site. It allowed us to put the RNA I construct under a constant expression of different Anderson promoters. The copy number of each plasmid controlled by RNA I, which expression was placed under different Anderson promoters, has been evaluated (BBa_K2259067; BBa_K2259068; BBa_K2259069; BBa_K2259071). Figure 1. The plasmid copy number of differently expressed RNA I constructs. The results in the fig. 1 demonstrate that we have constructed a particular-expression RNA I devices which influence the plasmid copy number. As promoter's strength increases, the concentration of RNA I molecules rises as well, therefore plasmid replication is inhibited. We have shown that plasmid copy number is inversely proportional to the strength of the promoter that expresses the RNA I molecule. ColE1 based independent origins of replication and global copy number control. Our team has designed synthetic origins of replication based on the ColE1 replicon. We have demonstrated that two origins of replication do not cross-interact and form independent plasmid groups. 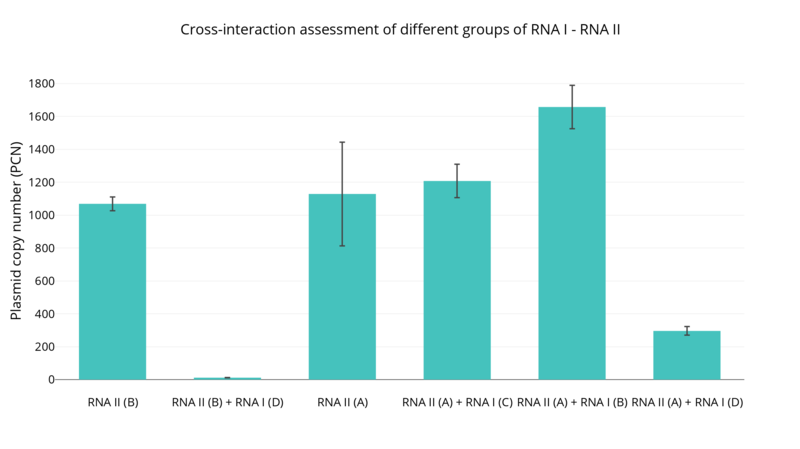 By evaluating the plasmid copy number decrease when group A RNA II is present with group B RNA I and vice versa, we have concluded that replicons A and B do not interact with each other. Next, we have co-transformed both A and B plasmid groups with their corresponding RNA I to determine the copy number of each plasmid. In addition, we have included different levels of ROP protein to assess the global plasmid number control. Figure 3. Plasmid copy number of two co-transformed groups of plasmids. Fig. 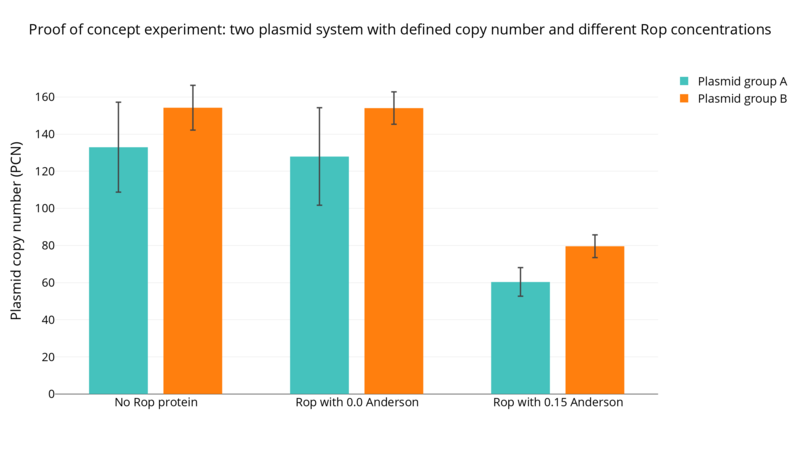 3 proves that both plasmid groups can be measured separately in the same sample and, in contrast to A and D group results, the A and B group replicons do not cross-interact as the plasmid copy number stays higher compared to interacting A and D replicons. It therefore proves that both replicons function independently because the copy number does not drop, when the plasmids are co-transformed together. 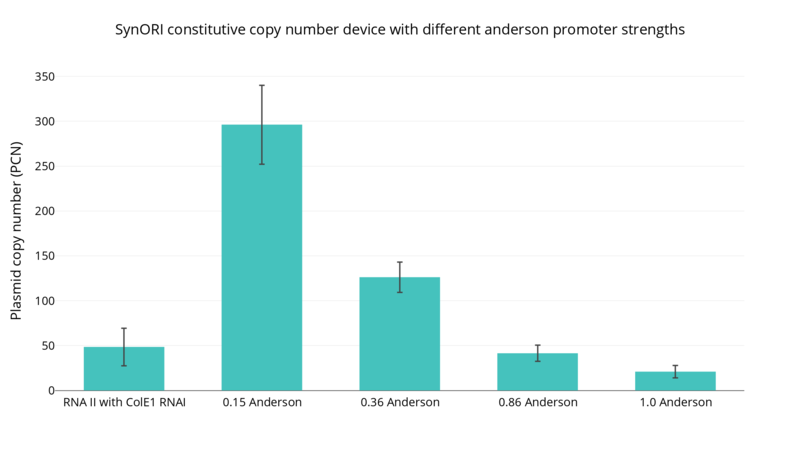 Furthermore, by expressing the ROP protein with different Anderson promoters, we have demonstrated that our global copy number control devices work as intended and lower the copy number of both plasmid groups equally. Fig. 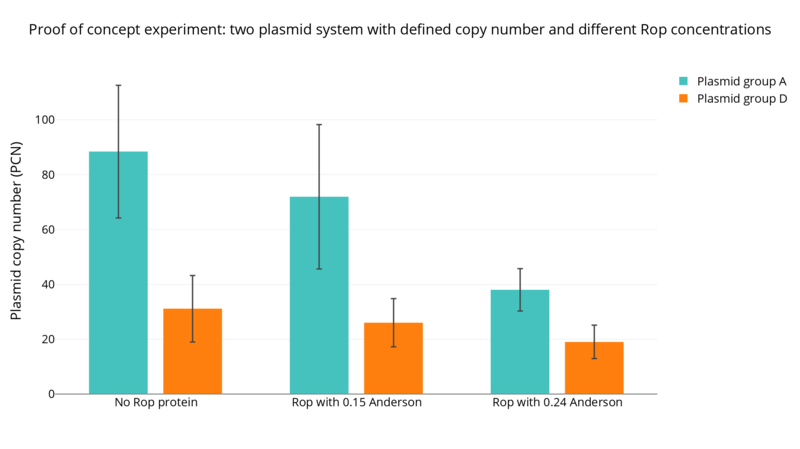 3 demonstrates that the expression of ROP protein results in the copy number of both plasmid groups in distinct experiments decreasing unanimously. This concludes the function of ROP protein as a global plasmid copy number control device.